Monique Poullot makes, repairs and restores all bows used to play those instruments of a string quartet, as well as double bass and baroque bows. Born on the 6th of March 1961 in Dijon Monique's training began in 1989 with a renowned bow-maker; a former pupil of Bernard Ouchard, and a graduate of the School of Lutherie and Bow-making in Mirecourt, Vosges. Following 24 years with her mentor, she perfected her craft under Jean Marc Panhaleux, master bow-maker, in Lille. Throughout this time Monique took valuable advice from a master bow-maker of global renown, Stephane Thomachot, and further refined her skills. 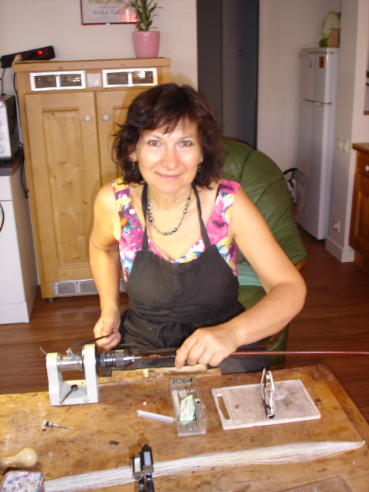 Monique set up her own workshop at the foot of Mont Blanc in 2012 where she has found the tranquility required to successfully pursue her craft. She is a member of the Association of Luthiers and Bow-makers, whose members develop and manufacture stringed instruments. The quality and precision of Monique's products have helped her to forge unique and close bonds with clients from many countries, to which she often travels. These include: Japan, USA, Switzerland and, of course, France; more specifically Paris where she works for several distinguished families. I run a cottage industry making bows for violin, viola, cello and double bass instruments, as well as baroque bows. In my workshop I individually craft each separate component, and have specifically chosen Brazilian Redwood for the standard and Snakewood for the baroque bows. My frogs (heels) are handcrafted from ebony, combined with either silver or gold. I have the facility within my workshop to effect rapid repairs of hairs, bow-screws, tips, sticks, pads as well as straightening. Furthermore, I restore ancient bows, this work includes: refilling, replacement of worn-out wood, making copies of buttons, replacing horse hair and fixing head breaks.